Relaxed and at ease before the photographer’s gaze, Miss Welty wears a wide “walking skirt” and a silk shirtwaist with a pleated bodice, overlaid with a lovely drop-shoulder lace yoke. Daughter of Fairplay, Maryland undertaker David Welty and Laura A. Shafer Welty, Nora married Hagerstown coal mine operator William Garfield Barnheisel later that year. In 1916, the journal Coal Age mentions Barnheisel as president of the newly-organized Casselman River Smokeless Coal Company of Gettysburg, Pennsylvania. The company, Coal Age rreported, planned to develop mines on 2,000 acres of land it owned in Somerset County, Pennsylvania. Nora grew up in Fairplay, a rural area of Washington County, Maryland. After her marriage, she lived with her husband and two daughters, Margaret and Jane, in Hagerstown. Nora died in Santa Monica, California in January 1951, and William followed her to the grave in September of the same year. According to her obituary in the Hagerstown Morning Herald, Nora is interred in the mausoleum at Rose Hill Cemetery, Hagerstown, Maryland. 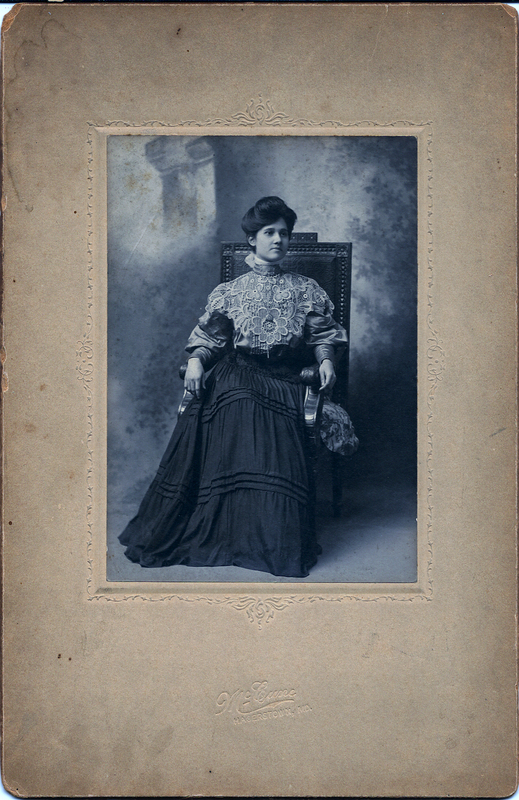 Charles Brewer McCune (1869-1953) operated a photography studio in Hagerstown for some 35 years. Like Nora Welty Barnheisel, his remains rest in Rose Hill Cemetery, Hagerstown.